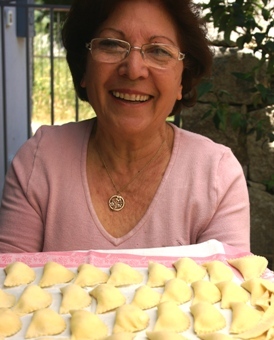 My neighbor Beatrice Floridia with homemade ravioli in Sicily. Like many home cooks in Italy, my neighbor Beatrice’s idea of a recipe was vague (use a “handful” of flour per person) or filled with expressions that required imagination, such as adding enough tomato sauce to a pot of meat so as to “make the meat comfortable.” Still, working side by side with her in her home kitchen, I managed to make some excellent ravioli, and the meat must have been comfortable, because the sauce was great, too. Here are my photos, notes on technique, and a recipe for making Sicilian ravioli – many thanks to Beatrice Floridia for the neighborly cooking lesson and lunch. Ravioli in Sicily, at least where I live near Modica, are made with hard wheat flour, and are served with a flavorful tomato sauce in which hunks of pork and fennel-spiced sausage have been simmered. 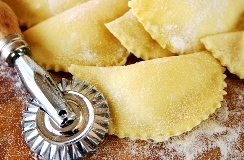 The ravioli are filled with cow’s milk ricotta and a tiny grating of nutmeg. That’s it – the filling should be bland to contrast with the meat sauce. 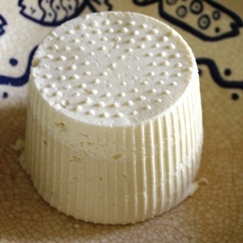 Variations in Ragusa, just 10 kilometers away, might include grated lemon peel in the ricotta filling, or sugar. (These are called ravioli dolci, and are still dressed with the pork sauce.) But we are in the township of Modica, so no sugar or lemon peel comes near these ravioli. Ravioli are a common dish in our corner of Sicily, but often the dough is too thick, giving a heavy gummy texture to the ravioli. We’ve been disappointed by the ravioli in farm restaurants on numerous occasions, and Emanuele recently claimed that he simply doesn’t like Sicilian ravioli, period. So Beatrice was facing an uphill battle to make us into Sicilian ravioli converts. She succeeded. The ravioli were tender and plump, the meaty sauce was aromatic with fennel, and the grated caciocavallo added just the right salty-sharp contrast to the mild ricotta. 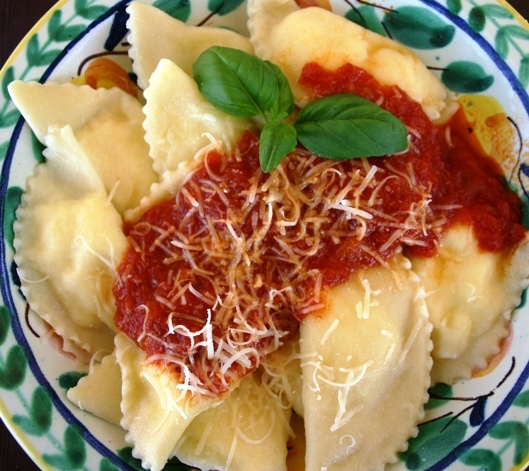 See Anita’s detailed Sicilian Ravioli Recipe. Cook with Anita on a 1-day tour in Sicily. 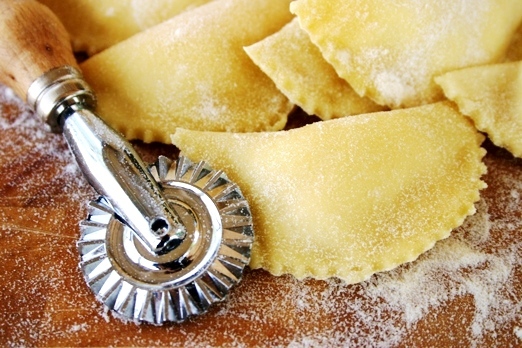 Learn to make ravioli & lots more on our Walking & Cooking in Eastern Sicily tour. Ready to eat - plateful of homemade Sicilian ravioli wih pork sauce and grated caciocavallo cheese. Yes, it is interesting how “traditional” dishes are made differently from one region to the next. The art of making egg pasta in Emilia-Romagna is unmatched, and watching expert hands make tortellini is an amazing experience. I had not heard of the donkey meat filling (though have eaten donkey in Piedmont) and don’t think it would be my first choice in stuffing. Hello, I just got back from Modica where my parents were born. My mom used a pinch of nutmeg, but my cousin used a pinch of marjoram! Interesting. My grandfather was born in Frigintini, u fiortu!